The Tarbell Course in Magic is the most respected, awe-inspiring course in magic. 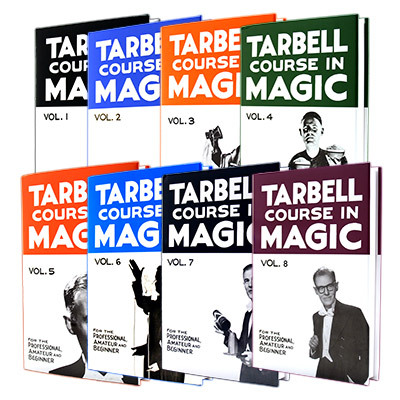 Tarbell Course in Magic Choose an option"Volume 1" "Volume 2" "Volume 3" "Volume 4" "Volume 5" "Volume 6" "Volume 7" "Volume 8"
There are a total of 8 volumes, over 100 lessons, more than 3,370 pages. Each book is hard bound with dust jacket, approx. 400 pages each. Written by Harlen Tarbell. Every category of magic is covered, from stage to close-up, mentalism to comedy, children’s tricks, plus lessons on theory. Whether you are a professional magician, or one who aspires to become a working pro, these books have a wealth of valuable information! "Volume 1" "Volume 2" "Volume 3" "Volume 4" "Volume 5" "Volume 6" "Volume 7" "Volume 8"